Has spring sprung? Looks like it in the middle of our meadow outside. The birds are disappearing, the birdhouse is empty and there are only one or two pecking on the remains of the seed containers hanging on the bushes. Now they can begin to search for this years partner and build nests. We have one of those grey mornings, so hoping for something better. Today there is nothing special going on. Mr. Swiss got the provisions yesterday accompanied by two phone calls from the supermarket. It seems they were out of tinned tomatoes and he only found the smallest tins. He was also looking for sage leaves, but only found the powdered sage. It is times like that when I so wish I could go shopping again. He does a good job, really, I am not complaining, but after 50 years of shopping for the family you develop an eye for what you need and want. I realise now that what is instinct for me is a mystery for him. I am really a bit down at the moment. We both do what we can, but it is just not the same when I cannot yet stand alone and independently. I am just not sure enough yet and my therapist also says it is too early. I just want to take a vacuum cleaner in my hands or a mop and walk around the place. It is not a big job, just the normal surface cleaning, but I have to hold onto stuff and balance the mop on my walker to do it all. I could say forget it. I did for the first week I was out of hospital, but nothing was the same. Everyone says how well I am doing but I do not notice very much. It looks like we Swiss will be voting again. For some time the powers that be have been talking about buying some new jets The first attempt failed because they decided to buy something Swedish that was still on the drawing board and we all said no. Now we can say yes or no to buying, and later it will be decided what we will buy Swiss to vote (again) on buying new jet fighters. I am still wondering why we need them. I suppose our pilots have to do something to keep them busy. In the meanwhile, in between, I did my cleaning practice and now I can just lead a life of luxury until I begin to cook. Enjoy the day, see you around. I am sorry that you are still a bit down. It is good to get your ‘good morning’ posts in the first few minutes of the morning. Love your crocus. They are cheerful. A always harbinger of spring. Now and again I am really quite down. I have now got a new method of walking, trying to rely on my walker as little as possible. Just relax and stroll with it. I can cook OK and can use my stick to learn on. I’m surprised to learn of your voting for/against purchase of fighter jets — I’ve always understood that Switzerland was a neutral country, and to me that meant that you didn’t have or need military accoutrements. Of course we are neutral, so we have our fighter jets to remain neutral. Personally I find it a lot of money to spend on planes. The last time we voted on it, it was turned down by the majority of Swiss people. All Swiss able bodied men serve in the army etc. for 3 weeks every year, officers longer. They are exempt from duty when they have fulfilled their time as a soldier. My youngest son was in the Swiss army and completed his time. They have a uniform and all the trimmings that you keep at home until they are called up and each Swiss soldier has a rifle at home. The officers and the voluntary women have pistols. I wouldn’t like having to vote on such an expenditure without knowing what the money would buy! That’s an interesting system — it would seem to me that 3 weeks a year is pretty disruptive to a young man beginning his career, though I imagine it’s accepted by employers as part of the system! We are all settled in with groceries and hoping that the next storm, now set for Tuesday or Wednesday, won’t wipe us out again. 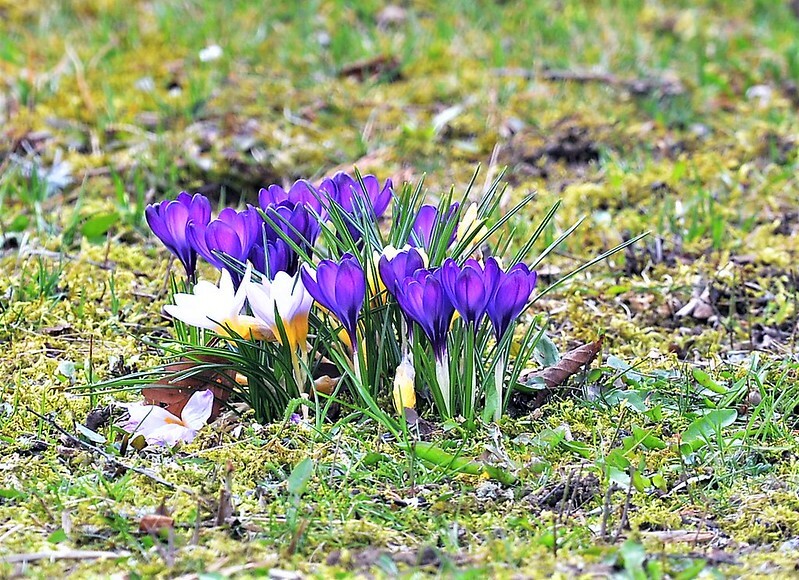 Love your crocus. It’s very grey and cold here. I’m tired of this winter. And what a mess we have outside now that the plow guy plowed our entire back lawn!